Posted September 5, 2017 • filed under Research. In the Summer of 2017, I have found myself in the novel position of teaching a drone to write poetry. Such endeavours invariably have a story behind them, and this article will offer a short background on how my practice-led approach towards research has resulted in this latest project—which, at a still nascent stage of development, is entitled Waveform. My focus, both as an artist and researcher, is on generating different methods through which digital media, as a diverse matrix of activities, artefacts, and infrastructures, can be investigated, explicated, and presented anew. In recent years, I have sought in-particular to engage and evaluate the formidable complexities of the contemporary digital environment from a practitioner’s standpoint—to treat it as a “structure for what does not yet exist”, to appropriate a phrase from pioneering digital author Michael Joyce (2003, p. 616), and explore what potential modes of thought and expression it might support. My approach is informed by what has been characterised as the ‘performative’, ‘materialist’ turn of the past decade in the humanities. Here, it is understood that human knowledge-making operates not just at the level of the textual, the abstract, and the ocular, but is entangled fundamentally with the entire range of material structures and processes that both constitute and render the world observable (see Salter, 2010). This outlook emphasises how the world’s unfolding takes place at scales and durations far beyond our own native capacities of sensing and knowing—that there is always an excess of possible perspectives, sensations, and relations, which can never be captured fully. From this standpoint, the production of knowledge always involves an exploratory, creative aspect, with the world being performed anew within the space of every enquiry, actualising yet more of its potential. Moreover, such performances necessitate the entangling of different actors, both human and nonhuman, in modulating their varying capacities of perception and action within the experimental milieu they constitute—actualising this in such a way as to specify and then measure certain processes involved. We might think of scientific equipment here, in which complex and varied apparatuses, tuned assemblies of different energies and materials, perform specific phenomena in ways that can be registered and rendered measurable from the standpoint of human perceptual and cognitive thresholds—but which, importantly, never exhaust the possible behaviours, measurements, and understandings that might be made subsequently (see Pickering, 1995; Barad, 2003). Another example can be found in the creation of new artistic works. Here, the properties of different mediums, tools, and techniques are engaged and explored through practice, establishing a dynamic whose outcome represents the crystallised trace of this exchange between human and material agency, with the impressions of unrealised possibilities being the catalyst for future work. To understand the resonance of these critical sentiments for the study of digital technology specifically, we can observe statements made in the context of media theory and practice by writers such as Jussi Parikka (2012) who discusses how “media critique is not only about saying things, it is about design and materiality—doing critique in an alternative fashion, against the grain, so to speak” (p. 43). Here, the production of experimental, speculative, or ‘imaginary’ digital media functions not as an abstract window onto an a priori domain, but as an apparatus for entangling critical thought within the concrete structures, practices, and assumptions constituting the contemporary environment, enacting the conditions in which novel insights and alternatives might emerge. It is visions such as these which have informed my efforts to place practice-led methodologies at the heart of my own research. Interested as I was in the creative entanglement of literary expression with the capabilities of digital multimedia—often referenced as ‘digital’ or ‘electronic literature’—this drive manifested initially in the production of what I termed ‘Solid State Poetry’ (see Carter, 2017). This involved the parsing of text into visual forms that would illustrate how digital systems, as formations that embed and sustain discrete information environments, possess a very different quality of perceptual agency from that of the human—rendering the slippages, ambiguities, and fluidity of our written communications into numerically encoded electrical signals, whose advantages stem precisely from the way they exceed the spatial and temporal thresholds by which we come to know and express the world. It was in developing this basic agenda that I considered how I might invert these initial predicates and discover ways of parsing visual data—digital images—into a form of poetry. Such efforts would provide a catalyst for reflecting in more detail not just on the different modes by which human beings and digital systems sense and make sense of the world, but to present a vehicle for considering the material conditions in which digital sensing is made possible in the first instance—the specific hardware, imaging software, and signal extraction techniques involved. Moreover, given the popular association of digital data gathering with ever-increasing degrees of pervasiveness, resolution, and precision, an opportunity would be presented to deconstruct the genealogies of technology and discourse that enable and perpetuate these visions, outlining the basis for an alternative, more contingent depiction of the sensory in the process. It was in pursuing these lines of enquiry that I assembled the basic components of my latest project, Waveform—a title which evokes the processing of continuous environmental signals into the discrete ‘waveforms’ utilised by digital systems. 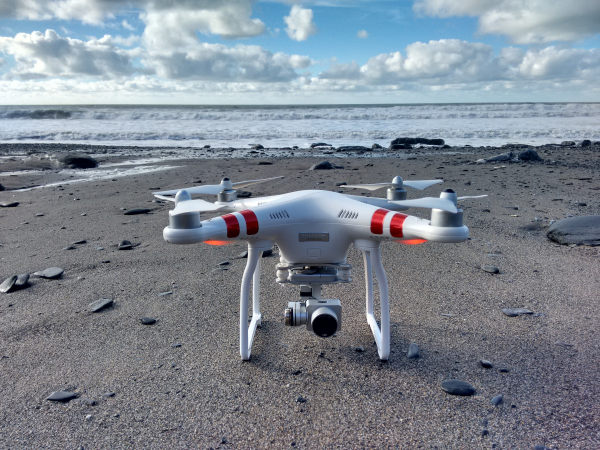 Here, a drone platform is being used to capture images of different patterns of incoming ocean waves across various Cornish beaches. This choice of location is driven by my interest in the role of digital sensors in the gathering of environmental data—part of an increasingly urgent scientific drive to map the impact of human agency at a global scale. Furthermore, in using a drone, as opposed to a conventional digital camera, I have sought to present a more explicit instance of an observing agent operating as part of a wider sensory and interpretative network, and so undercutting any notion of sensory systems as presenting a Cartesian ‘view from nowhere’. The images gathered by the drone are processed separately by a simple form of machine vision software, which I have developed using the open-source Processing toolkit. 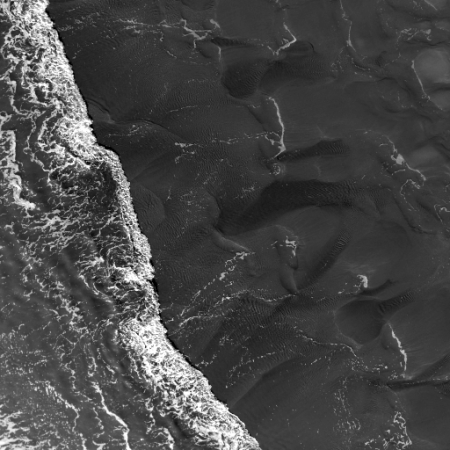 This software analyses the scene and attempts to draw a line where it perceives the edge of the shoreline resides. This is, by design, an uncertain process, yielding some incongruous outcomes, but any resulting errors help to articulate the functioning of the system as a constructed technical artefact, founded on the careful tuning of contingency, as opposed to a pristine, ‘black boxed’ abstraction. 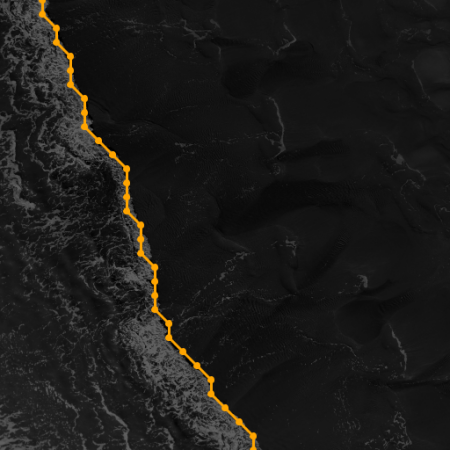 The final stage of the creative process involves the data points that constitute the detected shoreline being used to inform the selections made by a poetry generation algorithm (again developed using Processing), which aims to produce outputs that are thematically responsive to the maritime aspects of the source imagery. There are multiple aspects to this final stage, but one of the most significant for me concerns how machine detected signals are remediated so as to be rendered accessible to human observers, and whether, in an artistic context, alternative strategies of data presentation can make us more sensitive to the implications of our contemporary moment. 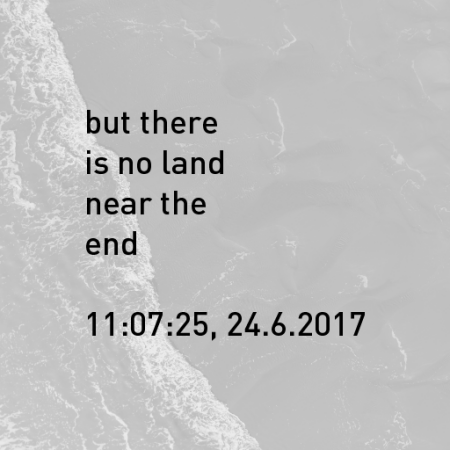 The planned outcome of the Waveform project, ongoing through 2017/18, is the production of multiple image sequences that articulate the various stages by which the final poems emerge, compiling these into a finished artist’s book. As a mode of research, Waveform seeks to produce a speculative media assemblage that draws together a range of technologies, techniques, and perspectives on the functioning and purpose of digital sensory systems. In so doing, it is affording me the opportunity to gain not just a practical sense of these systems as they are developed and deployed—particularly concerning how the former affects the outcomes of the latter—but also to reflect critically on what may be described as the contemporary aesthetics of the sensory. That is, to evaluate the practical and conceptual paths through which different phenomena are established as entering into a sensory relationship—of shorelines, and pixels, and poetic excerpts—and how these relations are then presented so as to be understood and rendered meaningful by different architectures of interpretation—different collectives of humans, machines, and scientific and artistic discourses. As a creative enterprise, the technical properties of Waveform afford it a certain resonance with number of recent debates concerning the problems posed by large-scale data gathering, drone surveillance, and the algorithmic sorting and reprocessing of digital imagery. An enquiry might thus be made into the potential of Waveform to function as an activist intervention—to demonstrate the potential of drones and digital sensing to operate in ways that subvert the commercial or military impulses with which they are most commonly associated. However, as a theorist and practitioner, I remain wary of making bold claims along these lines. As much as I find it critically and creatively provoking to deploy drones to render poetry out of waves, such endeavours, at best, constitute only a very small act of resistance against the wickedly complex forces driving the social and political ills of late modernity. While I may hope that Waveform will function as a vehicle for the raising of important questions, and maybe even a source of inspiration, I would not wish to present it as a model, nor as a substitute, for the hard, difficult task of direct political engagement. Nevertheless, this point aside (tapping as it does into perennial debates surrounding the political efficacy of art), I would submit that Waveform does offer a certain value in prototyping an alternative way of approaching and understanding the sensory. In working against the prevailing vectors of control, the absolute, and the cynical exploitation of the abstract, and pursuing lines of experimental enquiry and imagination, Waveform stands as a testament to the possibility and potential for change, reading the signals of an emerging world not what they are, or for what they should be, but for what they might be, instead. Interested readers can follow the progress of Waveform at the author’s website, richardacarter.com/waveform, and @RichardACarter2 on Twitter. Barad, K. (2007). Posthumanist Performativity: Toward an Understanding of How Matter Comes to Matter. Signs: Journal of Women in Culture and Society, 28(3), 801-831.
http://richardacarter.com/solid-state-poetry/ [Accessed 19 July 2017]. Joyce, M. (2003). Siren Shapes: Exploratory and Constructive Hypertexts. In N. Wardrip-Fruin and N. Montford, (Eds). The New Media Reader. Cambridge, MA: MIT P, pp. 614-624. Parikka, J. (2012). What is Media Archaeology? Cambridge: Polity Press. Pickering, A. (1995). The Mangle of Practice: Time, Agency & Science. Chicago, IL: Chicago UP. Salter, C. (2010). Entangled: Technology and the Transformation of Performance. Cambridge, MA: MIT P.
Dr Richard A Carter is an academic researcher and digital artist based in York. His current research is on understanding the varied modes by which human and non-human actors come together in works of digital art and literature. Richard’s artistic practice represents an extension of this research and is concerned in particular with developing new forms of digital writing that express the structures and processes characterising digital activities, artefacts and infrastructures more generally.